Mediation is a method of resolving issues during separation. During the mediation process, the mediator is present to listen to your discussion and to act as a guiding force to ensure that all discussions are constructive and that both parties can have a fair say. This flexible process can be used to reach a number of decisions regarding financial agreements after a separation as well as arrangements for children. Mediation is not appropriate for those who are looking to resolve issues within their marriage the mediation service offered by a mediator is used to resolve issues and reach agreements once you know that separation is inevitable. When is Mediation Not Appropriate For My Situation? One of the first questions you may ask when considering mediation is: “when is mediation appropriate?” There will be situations in which mediation may not be appropriate which therefore results in mediation not being compulsory should a relationship break down or you are facing a divorce. Due to the fact that trust and honesty is important during the mediation process (especially when disclosing financial information) mediation is likely to not be possible in this situation. You need to feel safe during the mediation process so if domestic violence or abuse has occurred during the relationship then mediation will rarely be relevant to the divorce or separation process. If there is a huge division or rift in the relationship or it is impossible to reason with one another or be in the same room as one another then mediation may also not be appropriate for your situation. Why is Mediation a Preferred Method of Approaching a Divorce or Separation? Mediation is a preferred method of approaching a divorce or separation, especially when combined with other approaches. As extended court cases can be costly and put additional stresses on the relationship and amicability of the separation, mediation is often recommended to be pursued before court proceedings commence. Effective mediation can help to reach financial decisions and decisions involving children and agreements that are made during a mediation session can be drawn up legally and signed to make these agreements legally binding. This brings clarity to both parties regarding their responsibilities and agreements after the separation or divorce process. In many cases, mediation is recommended during a meeting called a Mediation Information and Assessment Meeting or MIAM. This ensures that you have all of the relevant information available regarding mediation and the benefits of going through with mediation. Again, it’s important to bear in mind that mediation isn’t an ideal solution for everyone and that it is not mandatory to arrange for mediation before court proceedings are issued. What if I Still Can’t Reach a Decision After Mediation? Although mediation can be an effective method of reaching decisions, it’s not always the case that mediation will lead to resolutions being reached. If this is the case and it has become difficult or impossible to reach decisions with your spouse then court proceedings may be issued should financial agreements or agreements regarding your children cannot be reached. We can represent you either during the mediation process and represent you in court should you have to go down this route. It’s highly recommended to seek the advice of a family law solicitor when going through a divorce or separation. One of the benefits of working with a family law solicitor that is trained in mediation is that the mediator must be impartial at all times and a neutral party when discussing issues that are being faced during the divorce or separation. They will also act to represent you should discussions break down and you have to attend a court hearing. This means that you have access to mediation as well as access to the legal representation you may need should the mediation process not be successful. What Agreements Can be Made From Mediation? When an agreement has been reached, the meditator draws up an agreement of “Memorandum of Understanding” which sets out the agreements that are proposed which can be taken to a solicitor. Your solicitor will then advise you on the necessarily legal papers that are required as well as draw up the agreement to make this legally binding. An open financial statement and / or outcome of mediation or parenting plan can be created. Any paperwork that the court needs will be prepared by your solicitor and once this is presented to court, this will turn the agreement into a binding court order. 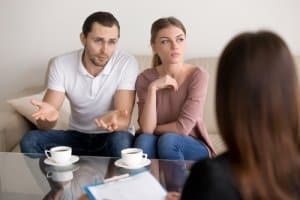 Again this avoids the costs of a lengthy legal battle and having to attend court can put added strains on your relationship after separation or divorce. If you personally decide that mediation is the right decision for you then you can discuss this with your partner. It’s important to bear in mind however that your partner may not be willing to enter into mediation. Mediation is not mandatory meaning that if your partner does not want to pursue mediation and wants to pursue a different avenue in reaching decisions, you are not able to make them attend mediation. Even if mediation is the ideal solution for yourself, this may not be the case for your partner. Allowing them to make their own decision and decide whether mediation is best for them is often the best path to take and it’s important to offer them all of the information that is available regarding mediation to help them reach a decision on whether they would like to go through this process. As we mentioned previously, mediation is not the best solution for some situations so if mediation is not possible then it’s highly recommended to contact one on of our family law solicitors.